The Alumni Ambassadors are recently returned undergraduate OTS students, who are passionate about sharing their experience abroad. They will partner with the Enrollment Management and Development teams to promote OTS programs and provide assistance on outreach and marketing strategies. Ambassadors have the opportunity to be featured on the OTS website, undergraduate blog, and social media. They will promote OTS programs at their home institution through hosting information sessions, giving short presentations in front of lower-level classes, hanging up posters, and acting as an OTS representative on campus. If you are a recent undergraduate OTS alum and would like to become an Alumni Ambassador, contact the Enrollment Management team at undergraduate@tropicalstudies.org. In the photos: Alumni Ambassadors Will Sweet, representing OTS at the Wheaton College Global Education Fair. 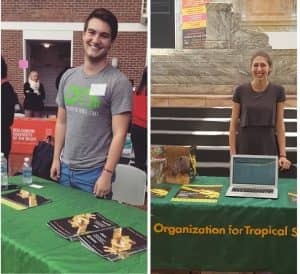 Will is an OTS alum from the African Ecology & Conservation in South Africa semester program; and Andriana Miljanic, at the Emory University Study Abroad Fair. Andriana is an alum of the Tropical Biology on a Changing Planet in Costa Rica semester program.